Lee Ann enjoys spending time with her family & friends, weekends at the lake, horseback riding, reading, & cooking. Lee Ann has run the Payroll Processing Department at SLH since 1993 and provided a wide range of reliable, prompt payroll processing & related support services to many clients in and around Delta County. 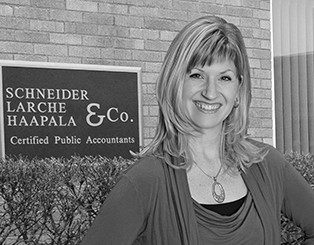 She was born and raised in the Gladstone/Escanaba area and joined the staff here at Schneider, Larche, Haapala & Co. in 1991 when she returned from living and working in Houston. She resides in Escanaba & is married with three children.